President Michael D Higgins has led tributes for Fine Gael Minister of State Shane McEntee, who died suddenly. President Higgins said Mr McEntee, who was 56, would be missed by his family and friends, colleagues in political life and the wider community. Mr McEntee, a farmer from Castletown near Navan in Co Meath, was first elected to the Dáil in 2005, in the by-election caused by the appointment of John Bruton to the post of EU Ambassador in Washington. He retained his seat in Meath East in 2007 and 2011, when he was appointed Minister of State at the Department of Agriculture and Food, with responsibility for Food, Food Safety and Horticulture. Mr McEntee was a farmer for 15 years before becoming a full-time politician, as well as an agricultural sales representative. He was involved in the GAA and had trained a number of football teams, including the Meath minors. He is survived by his wife Kathleen and children Vincent, Helen and Sally. President Higgins said Mr McEntee had "made an enormous contribution to community and public life throughout his career in farming and agriculture, as a TD representing the people of Meath in Dáil Éireann and to the world of sport through his involvement with the GAA". In a statement, Taoiseach Enda Kenny said he was devastated at Mr McEntee's death. "Since his election to the Dáil, Shane has been a dedicated servant of the people of Meath. As Minister of State, he brought great energy, diligence and enthusiasm to his role. "On a personal level Shane McEntee was a loyal friend and colleague and my thoughts and prayers go out to Kathleen and their family at this very sad time." Tánaiste Eamon Gilmore also expressed his sympathy to the family Mr McEntee. "Shane was a passionate advocate for his Meath East constituents, particularly for the farming community," he said. "His good nature and warm personality will be sadly missed by his parliamentary colleagues from across the political divide." Fine Gael Deputy Leader and Health Minister James Reilly has expressed his sympathy. He said Mr McEntee was a larger-than-life individual who gave 100% commitment to everything he did, whether it was his business, his constituents or his country. Dr Reilly said he would be sadly missed and he expressed his deep sorrow on a sad, sad day. Minister for Agriculture and the Marine Simon Coveney said: 'I'm deeply shocked and deeply saddened by the death of Shane McEntee. "My thoughts and prayers are with his wife and family at what must be an awful and difficult time". Fianna Fáil leader Mícheál Martin said Mr McEntee was a true gentleman who commanded the genuine affection and respect of people on all sides of the House. Sinn Féin leader Gerry Adams said his thoughts are with his family, friends and colleagues at this sad time. 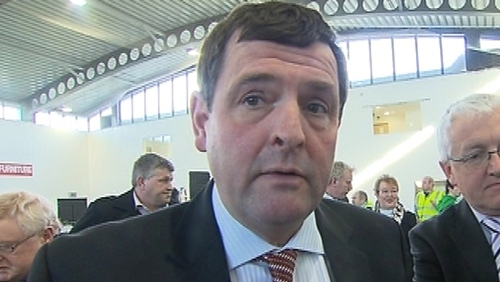 IFA President John Bryan said the farming community was shocked beyond belief at the death. "He worked tirelessly on behalf of his constituents and the farming community to find solutions," he said. The management and staff of the Department of Agriculture, Food and the Marine have conveyed their deep sadness and regret on the sudden death of Mr McEntee.